Most days you just have to work with what comes your way. 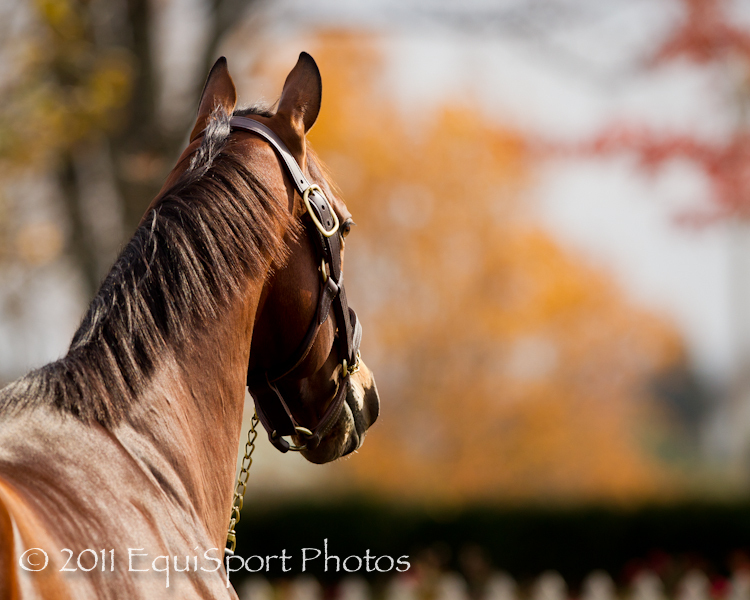 "Havre de Grace" was trotted out at Vinery on a beautiful Fall afternoon. Havre de Grace at Vinery. Photo: Matt Wooley, Aperture, f/5 @ ISO 320, 1/2000th, -1/3 EV, 300mm. 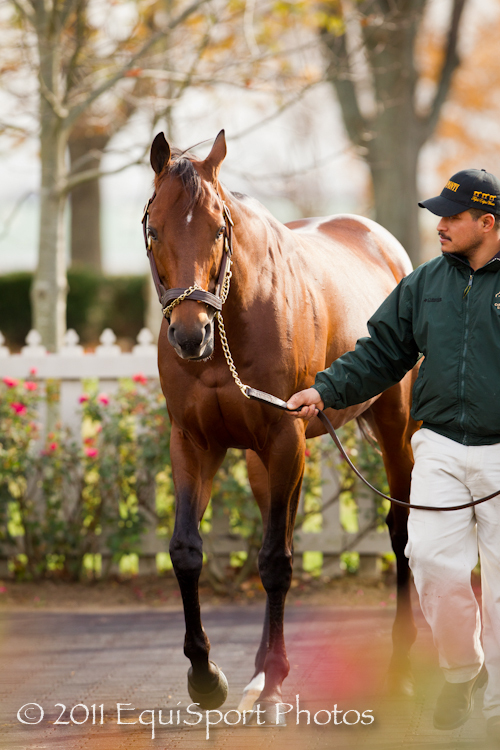 And "Gio Ponti" was featured at Castleton Lyons the next day, a very blustery day in the 100 acre woods. Wendy and I ended up getting a few good shots each day. Here's how we did it. 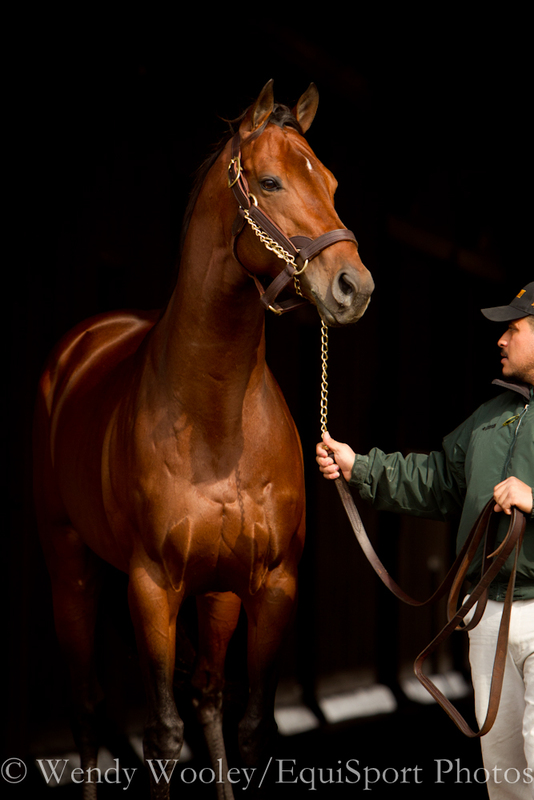 Gio Ponti at Castleton Lyons. Photo: Matt Wooley, Aperture, f/4 @ ISO 500, 1/1000th, +1/3 EV, 300mm. Look carefully at the exif data in the above two photos. The only big difference is the EXPOSURE COMPENSATION. Aperture, f/5 @ ISO 320, 1/1000th, -1/3 EV, 300mm. Havre de Grace, owned by Rick Porter's Fox Hill Farm, was shown in appreciation of her fans at the owners' request. She is a candidate for Horse of the Year, ran 4th in the Breeder's Cup Classic against the boys, and will resume training for Larry Jones after the New Year. "Havre de Grace Day" was a nice sunny afternoon. I wanted the colors to pop, and I wanted to protect the highlights. -1/3 EV did the trick! As is often the case, I shot tight (with a 300) and Wendy shot wide (with a 70-200). This way we get a good range of photos in a short amount of time, and we're not shooting the same thing as each other. Havre de Grace at Vinery. Photo: Matt Wooley, Aperture, f/4 @ ISO 320, 1/1000th, -1/3 EV, 300mm. Always be VERY conscious of the background, keep it clean. The f/4 helped me get some separation from the trees, and your eye goes straight to the intended subject. 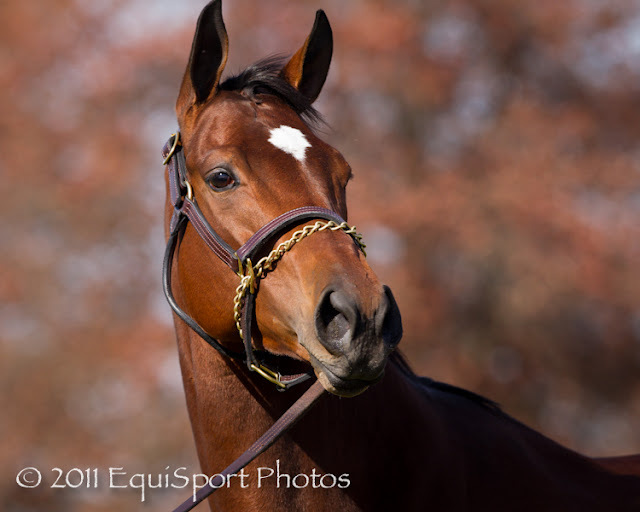 It turned out to be such a lovely day and nice turnout, and Havre de Grace of course being a beautiful race filly, that the Paulick Report thought it interesting enough to feature. Havre de Grace at Vinery. Photo: Wendy Wooley, Aperture, f/3.2 @ ISO 200, 1/2000th, -1/3 EV, 70mm. Aperture, f/4 @ ISO 800, 1/1600th, 0EV, 300mm. 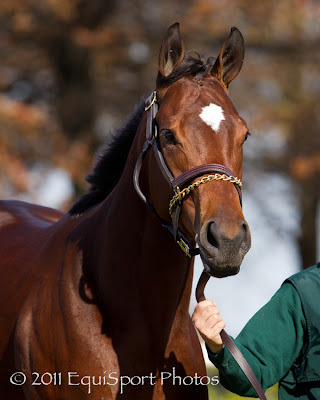 Gio Ponti, a homebred for Castleton Lyons, retired from racing after this past season. He collected 3 Eclipse awards in his brilliant career as a Turf Specialist. 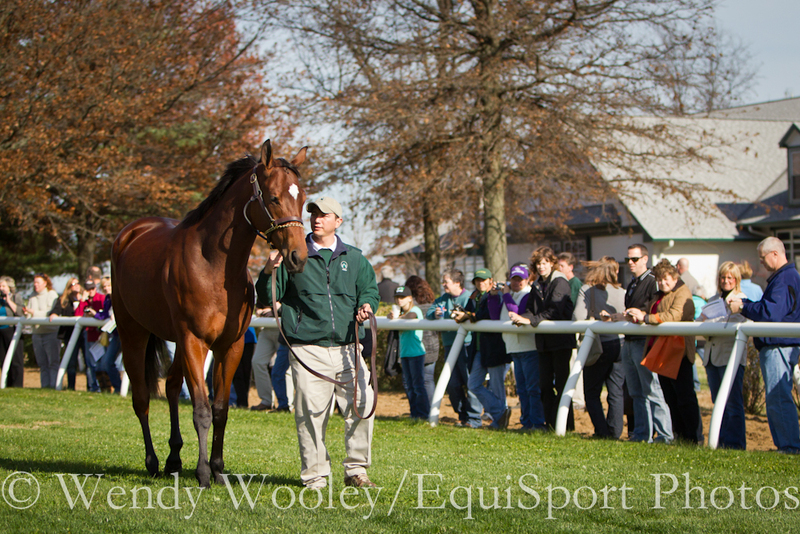 A repeat win in the G1 Shadwell Turf Mile at Keeneland this Fall highlighted his season. He will stand at stud at the farm. Gio Ponti, the next day, was shot under mostly cloudy skies, with the sun popping in and out. I ranged from 0EV to +1/3 EV to bring out detail in the shadows. I pushed it just enough to get a few "blinkies" on the LCD with the Highlight Alerts turned on. Aside from Exposure Compensation, one of the key differences in camera settings is the choice of CLOUDY WHITE BALANCE for Gio Ponti. This gave me nice warm tones on an overcast day. I'm shooting in RAW, as always, but shooting in "Cloudy" means one less thing I need to do in Lightroom. 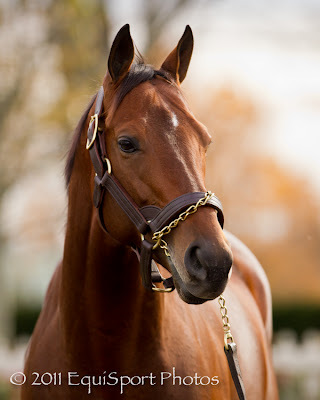 Gio Ponti at Castleton Lyons. Photo: Matt Wooley, Aperture, f/4 @ ISO 800, 1/1600th, +1/3EV, 300mm. Gio Ponti at Castleton Lyons. Photo: Matt Wooley, Aperture, f/4 @ ISO 500, 1/2500th, 0EV, 300mm. Clean backgrounds and shallow depth of field help make these photos work. 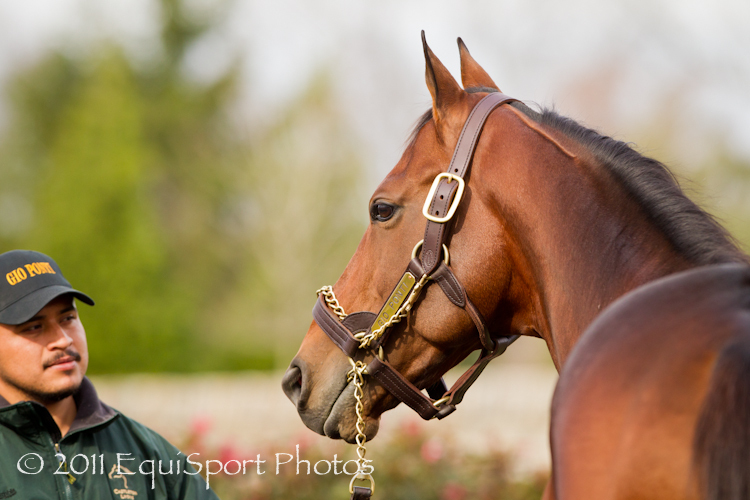 Gio Ponti is actually looking out at a field of mares in the above shot... guess he's done racing. Wendy got this great shot as he was led from the barn. 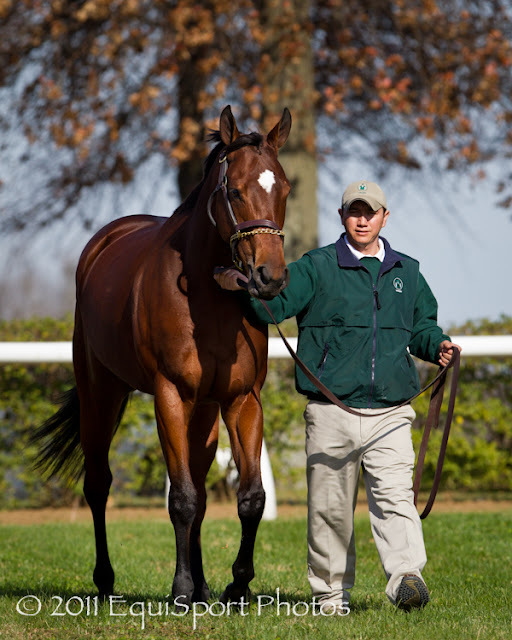 Gio Ponti at Castleton Lyons. Photo: Wendy Wooley, Aperture, f/4 @ ISO 200, 1/500th, -1 1/3EV, 180mm. The key to this shot is the MINUS EXPOSURE COMPENSATION. Without doing much of anything else, all she did was dial the EV down to -1 & 1/3. Perfect. As the horse is led into the daylight, the inside of the barn goes away and makes for another clean background. That's about it for now. We would love to hear from you! Please send us comments, questions. Or suggest a topic you would like for us to discuss. Thanks. Gorgeous horse and pictures!!!! 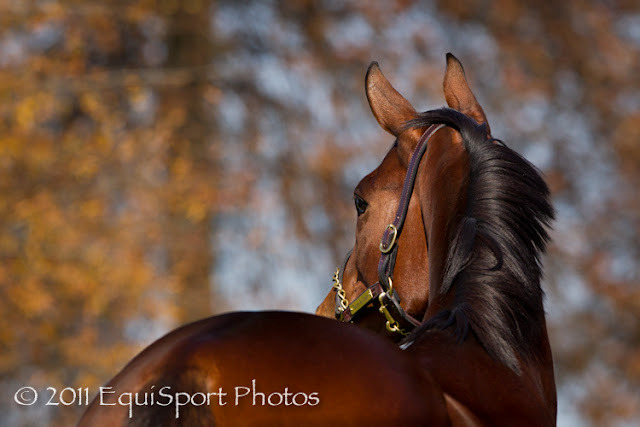 I made EquiSport Photos a favorite earlier today so that I don't miss any pictures.